February, 2015 - In the well-respected Roper Survey, the American public named PBS the most trusted public institution in America for the 12th consecutive year as well as an "excellent" use of tax dollars. PBS was also called the most fair network for news and public affairs. In addition, PBS KIDS was named the most educational TV/media brand, the safest destination for children to watch television or visit online and the top provider of content that helps children build reading and math skills. In the Fall of 2012 WNIT's documentary, THE POWER OF 100: THE STORY OF THE 100 BLACK MEN OF SOUTH BEND was nominated for a Chicago Midwest Chapter Emmy award in the category "Outstanding Achievement for Documentary Programs/Topical." 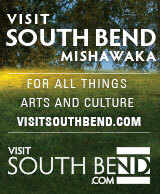 In April 2012, WNIT received the Pride of Place award from Downtown South Bend, Inc. The Pride of Place awards are given to downtown businesses and buildings that demonstrate outstanding design. On December 10, 2012, the American Red Cross presented WNIT Public Television with its Outstanding Partnership Award in recognition of WNIT's generous media support of the Elkhart County Chapter. Kicking the Notes the Toradze Way is a performance documentary of political rebellion, passionate performance, and extraordinary master teaching. Alexander Toradze's dream of artistic freedom in America instigated his defection from the Soviet Union and the founding of a one-of-a-kind classical piano studio in South Bend, Indiana - The Toradze Piano Studio. The dramatic story of his life and the Studio's is central to the documentary and is punctuated with their stellar musical performances and locations from around the world. Linda Schaller is the project's producer and director and Angel Hernandez, WNIT's Vice President of Production, is the Executive Producer. Outstanding Achievement for Editing (Non-News) - Tim Schaller. May 20, 2010 - Awarded a National Endowment for the Arts grant for its production of Kicking the Notes the Toradze Way. The $10,000 grant was based on the program's excellence and merit. The NEA grant is one of the most sought after grants for artist and art related institutions seeking support for their work and their missions. The documentary was judged to be a program of "artistic excellence, with the potential to reach a significant national audience, regardless of the size or geographical location of the applicant organization." October 2010 - Named one of the top 24 finalists in the prestigious International Television Festival Golden Prague awards. The ITF Golden Prague is a unique and prestigious showcase of TV production, presenting the world's best music and dance programs of all musical genres, including classical, rock, pop and world music. November 2010 - The Indiana Broadcasters Association awarded its Excellence in Broadcasting citation in the category "Special Interest and Cultural Programming" to WNIT Public Television for its documentary Kicking the Notes the Toradze Way. In June 2009, WNIT Public Television broadcast the premiere of its documentary, Farm Fresh to You, which explores the Michiana region with specialty food retailer, restaurateur, caterer and passionate food lover Judy Kite Gosh. Along the journey, Judy introduces us to many of the area's top chefs, farmers, ranchers and wine makers. Some of our chefs are world renowned for the quality of their cuisine, including Jean Joho of Everest Restaurant in Chicago and Rick Bayless, host of PBS' "Mexico, One Plate at a Time." They demonstrate the advantages of eating locally grown and locally prepared foods. 2009 - Won the prestigious Indiana Broadcasters Association Spectrum Award for Special Interest and Cultural Programming. Outdoor Elements is the recipient of the 2014 Great Lakes Park Training Institute "Facility and Recreation Award." This award is given by the Institute's Board of Regents to recognize innovative park programs or facilities. The award will be presented at the Institute, February 25, 2014, at an awards dinner at Pokagon State Park in Angola, IN. Since 1947, the Great Lakes Park Training Institute has provided training and education programs designed for park and recreation agencies, professionals, and technicians. First Place by the Hoosier Outdoor Writers in the 2012 Broadcast Category for the "Fins & Feathers" episode. 2012 Outstanding Interpretive Program award from the Great Lakes Region of the National Association for Interpretation (NAI). The award was presented to parks or nature centers for a specific park program that furthers the interpretive profession and demonstrates an innovative approach or partnership. The award was presented at a ceremony in Perrysburg, Ohio, with parks, nature centers and historic sites from Indiana, Michigan, Ohio and Ontario competing for the honor. Outdoor Elements wins 1st place in the Hoosier Outdoor Writers Broadcast category for 2011. The award-winning episode was "The Pesky Critters." Outdoor Elements was awarded first place in the Broadcast category of the 2010 Hoosier Outdoor Writers Awards-in-Craft contest. The award-winning episode was "Spiders and Insects, Oh My!" Outdoor Elements was a finalist for the Indiana Broadcasters Association Spectrum Awards two years in a row in 2009 and 2010. In 2003 WNIT responded to breaking events in our community with TWIN CITIES: UNDERSTANDING THE ISSUES, a nationally recognized effort in support of a community in distress. WNIT was recognized as the American Public Television's Station of the Month for this presentation of factual information from community leaders.